People involved in the administration of criminal justice must raise their awareness of autism and Asperger syndrome, a leading charity says. Research by the National Autistic Society (NAS) shows that over 90% of police and solicitors have no training to help them to understand autism. The result is that those who have the disability are often misunderstood. The NAS is launching a campaign so that people with autism receive proper support from justice professionals. It is estimated that more than half a million people in the UK have autism - a complex, lifelong disability that affects a person's ability to communicate and make sense of the world around them. According to the NAS research, almost 80% of solicitors and more than 90% of police officers do not think that the legal profession has a high enough level of understanding of autism. Over half of both groups thought that lack of training and resources were the main problem, and three-quarters of police officers felt that lack of training time also contributed. "Through my work with families, I have experienced the deep impact that autism has on both the individual and the family unit as a whole," said Philip Moor QC, chairman of the Family Law Bar Association. "It is important that barristers and the courts - as well as other criminal justice professionals - are informed of the condition in order that misunderstandings do not occur." Howard Leftley - a solicitor who has considerable experience of representing clients with autism - says the problem arises where someone only has low level symptoms of autism or Asperger syndrome. 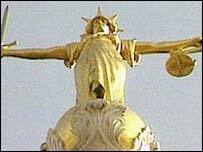 "In one case, a client was arrested more than 60 times in 12 months for offences that she did not commit," he said. "She was an individual with Asperger's syndrome and the confusion over her actions arose from a lack of awareness about the condition." Another of Mr Leftley's clients - a man in his thirties - was wrongly convicted of sexual offences against a young child after the man broke up a fight in a park. He was not represented by a solicitor when interviewed by police, and confirmed that he had helped the boy to rearrange his clothing following the fight. This was what had led to the misunderstanding and subsequent conviction. "People like this can't conduct themselves well in the witness box and the jury tend to form a bad impression of them, especially because they don't make eye contact," said Mr Leftley. "Those at the sharp end need much more training - lawyers included." The NAS has recently produced a card that anyone with autism can carry in order to explain their condition. 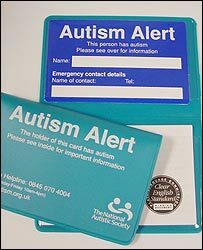 The Autism Alert card was designed to help people to identify their needs in situations where they find communication difficult. And the organisation has produced a information pack for criminal justice professionals which it hopes will improve their understanding of autism.